Looking for something a little different for your next gathering...you have found it!! I LOVED THIS RECIPE, Excellent & yummy recipe, easy to make too! Beef and potatoes are the main ingredients folded inside these wonderful deep fried samosas. Chicken livers may be substituted for beef if you choose. 1-2 onions, chopped very finely. 2 tablespoon coriander cumin powder. 1 bunch of fresh coriander, chopped juice of 1 lemon. Place your mince in a deep pan, add the ginger, garlic, chilies, salt, and spices, half of the coriander and half of the lemon juice. Dry the mince on medium heat whilst stirring constantly to avoid it forming lumps. Make sure you dry it completely if it sticks a little in the pan, that’s fine, it will make the mince taste better. Whilst the mince is still hot, add the chopped onions gradually and mix it in on low heat. You can add a touch of turmeric to change the onions color. Do not over-cook, just stir the mixture around for about 3 minutes and switch off. If you over-cook onions they will release water and your mixture will become soggy, it needs to stay dry. After you turn off the heat, add the butter, the remaining coriander, some garam masala and the remaining lemon juice. Mix the lot together, the mince’s heat will melt the butter and release the lovely aroma of the coriander and garam masala, make sure it gets mixed in thoroughly. Adjust salt and chilies. Let the mixture cool and wrap in samosa pastry. Fry until golden brown and serve with lemon slices. 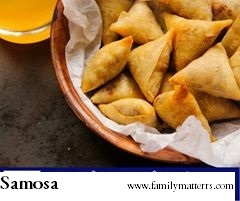 Your samosa should look yummy as in the picture above. However, if it looks like in the picture below, it means you are not doing it right. You should follow the recipe above and am sure at the end you will be smiling and proud of yourself.